Awesome LED Solar String Lights: Without the trifles of buying&installing batteries, solar charged, eco-friendly, high conversion, cost and effective! Auto-On and Auto-Off System: With Steady on and 7 blinking modes, automatically charge in daytime, auto-on at dusk and auto-off at dawn, free your hands and save your time! Freedom, Fresh and Romantic:With 200LED, 72ft length, cool white LED string lights, show your DIY talent, adorning what you like. Bathing your world in romantic atmosphere! Instant Installation and Easy Operation: Mount the ground stake, wrap the string lights on snowman or hang on trees in garden, porch, deck, fence, windows, etc. Set the mode you like most, then leave it here, once for all! Waterproof:Can withstand all kinds of weather, widely used for outdoor decorations. Can remember the lighting mode of the last timeif without power off. Please charge the solar panel for 8 hours before the first time use. After a long time of no sunny day, please charge longer then usual time. 1.Charge for 8 hours before the first time use. 2.If turn off or no solar power inside the panel, then you need to reset the mode the next time use. 3.There is a light sensor inside the solar panel, please avoid the bright environment when turn on to use it. 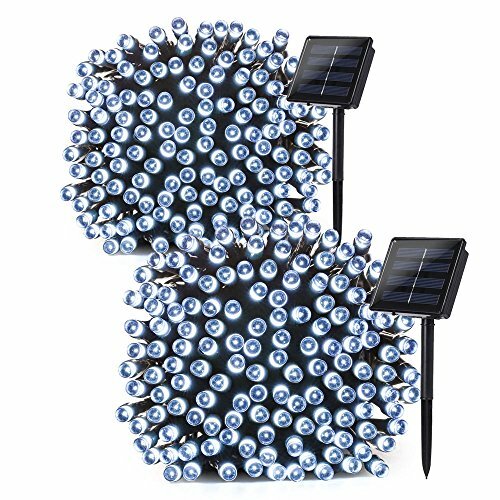 Easy to Install: With one ground stake for the solar panel, the string lights can be mounted anywhere you like, such as garden, trees, lawn, porch etc. Waterproof: Withstand any kind of weather, perfect indoor and outdoor decorations, especial for different kinds of festivals. Widely Used: Wedding, Holiday, Christmas, Garden, Yard, Lawn, Fence, Porch, Tree, Roof, Deck and so on. If you have any questions about this product by Lumitify, contact us by completing and submitting the form below. If you are looking for a specif part number, please include it with your message.